DONETSK, Ukraine -- Ukraine and pro-Russian rebels accused each other on Saturday of shelling residential areas despite a ceasefire, reporting four civilians and one soldier killed following a week of the deadliest fighting in over a month. 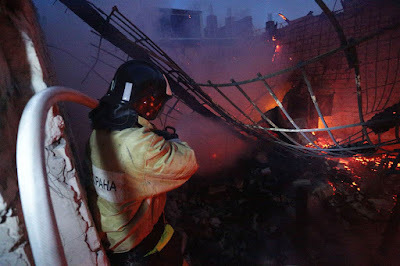 A firefighter extinguishes a fire after shelling between Ukrainian forces and pro-Russian separatists in the eastern Ukrainian city of Donetsk on July 18, 2015. Separatists said one man was killed by shelling from Ukrainian forces in central Donetsk. A Reuters witness reported seeing the body of man in a burning building, though it was unclear if it was the same person. More than 6,600 people have been killed since the conflict broke out in eastern Ukraine in April last year. Attacks have lessened since a peace agreement was brokered in Minsk, Belarus, five months ago, but both sides accuse each other of violations. "The vast majority of shelling and armed attacks by the rebels take place at night to avoid attracting the attention of international observers," Ukrainian military spokesman Andriy Lysenko said. He said separatists had focused their attacks on residential areas north-west of rebel-held Donetsk city and that one serviceman, a woman, her granddaughter and a 49-year-old man had been killed. Rebels meanwhile accused Ukraine of intensifying their assault. The sounds of incoming and outgoing artillery strikes could be heard in the center of separatist-held Donetsk on Saturday evening, according to the Reuters witness. None of the casualty reports could be independently verified. The Organization for Security and Cooperation in Europe (OSCE), which is monitoring the ceasefire, has said neither side have fully withdrawn heavy artillery from the frontline as required by the peace deal. On Friday, the head of the OSCE Ivica Dacic described a worsening humanitarian crisis in the east and urged both sides to adhere to the Minsk agreement, which he said was the only chance to achieve peace.